I have a bit of gaming problem. I’m starting to fall in love with some pretty heavy games, and I don’t have anyone to play them with. I won’t bore you with the details. It’s enough to know that I’m kind of low on free time and on accessible friends who are also fans of heavy games. If I want to play, I’m playing on my own. Yeah, I’m working on fixing this, but for now, that’s my sob story. The reality is that this doesn’t both me too terribly much. I view solo gaming much the same way as reading a good book or playing a video game. It’s just another single-person activity, but while there are a lot of great books and video games out there, I’ve had trouble finding many great solitaire boardgames with depth. I’ve pined for something to sink my teeth into, that would transport me to a new world and let me struggle through it, alone. This is when I discovered the series of COIN games from GMT. I’d encountered the term “COIN” before. I’d heard whispers about the system, but I didn’t know much about the games themselves. I had them pegged as “just another type of wargame”. As a euro gamer, and even as a euro gamer who enjoys heavy games, I didn’t want to get myself mired in the thick porridge of wargaming. Too long. Too complex. Not especially fun. Right? Wargames have been around for a long, long time. Conflict simulations (or Consims) have been used for ages as a way for military leaders to practice and vet potential battlefield strategies… but hobbyists began to seriously take notice in the early 20th century. 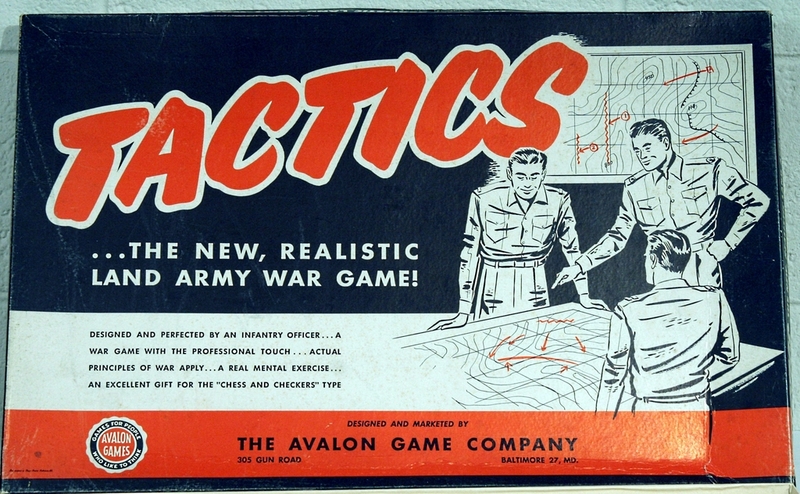 In the 1950’s, mass-market publication of wargames began in earnest with Tactics, considered by many to be the first proper hobbyist wargame. Wargaming continued to grow in popularity until it reached critical mass in the 1970’s with games like Squad Leader and Star Fleet Battles, and then started tapering off in the 1980’s. Back then, wargaming was entirely resolved on hex maps, comprised of dice rolling, blocks, or chit pulls. While these systems have been refined over the years and are still widely in use today, something new was in the air. In 1994, Mark Herman began the revolution of Card Driven Games (CDG’s) with his Avalon Hill title We The People, which brought a new element of cards into the wargaming hobby. This mechanism was also popularized by Twilight Struggle, which sat atop the Boardgamegeek.com rankings for almost five years. Then came designer Volko Ruhnke, a CIA national security analyst by day, wargame creator by night¹. Volko already had a couple of CDG’s under his belt with Wilderness War and Labyrinth: The War on Terror, but now he wanted to try something new with the form, examining more closely the subtleties of Insurgency. He took some basic ideas from euro gaming and mixed them together with what he had learned through designing CDG’s… and the result was Andean Abyss. Volume I of the COIN series. Despite coming to the wargaming and the COIN series rather late in the game, Andean Abyss is the first COIN game I bought and the first I learned to play. Set in 1990’s Colombia, the game examines the tensions between the Colombian government forces, the drug cartels, the marxist FARC guerrillas, and the paramilitary AUC. It’s a topic that Gene Billingsley, one of the principles at GMT, famously didn’t much care for. “I told him I couldn’t sell it,” he told the Washington Post in a 2014 interview² – and then he played the game. The first thing that struck me when opening up Andean Abyss was how different the board looked from what I view as a traditional wargame. There were a handful of counters to punch, but no hexes to place them in. Instead, there was something that looked like a map from an atlas, with clearly marked regions, roads, and cities. This approach to board design was more euro than wargame. It perhaps also took some inspiration from Area-Effect or Area-Impulse wargame systems, which ditch the six-sided hex spaces for more amorphous, geographically delineated spaces that follow terrain features. Gorgeous maps with a noticeable absence of hexes. Wooden cubes, discs and cylinders are all recognizable euro elements, and stand in for cardboard chits to represent the units on the board. Player aids list off the familiar processes that heavy euro gamers may have previously encountered in their travels, albeit slightly more elaborate. I won’t tell you I was entirely comfortable with approaching Andean Abyss the first time. It may not be on the scale of the epic Here I Stand, but it was still a large game by my standards. Luckily, I had already tackled a fairly involved GMT game with Joel Toppen’s Navajo Wars, so I was familiar with their gameplay tutorial approach. That tutorial helped ease me in to the concepts, but keeping all the procedures and one-off rules retained in my head was tough. This is especially true if, like me, you’re approaching the tutorial in 30 minute sittings… learning a bit here and a bit there with breaks of a day or two. Andean Abyss took me a week to finish the tutorial this way. It’s an achievement of the design that despite my piecemeal approach to learning it, everything seemed to click. I could easily set the tutorial down and pick it up where I left off a couple days earlier. After the tutorial was over, I continued with finishing that game, and then played another. The processes made sense, and the player aids were invaluable in reminding me how everything was intended to work. Even more than this, I was having fun! Perhaps the most clever aspect of COIN is the way the cards are handled and the impact they have on player turns. COIN is a card driven game system, but not in the sense that players have a hand of cards. Instead, there’s a single deck of cards that is revealed two cards at a time. One is the active card, the other is simply visible on top of the deck as the card to be played on the next round. Players can use that knowledge of the upcoming card event to help plan their current turn. Icons along the top of the card show how the four factions will resolve turn order. The trick is that two factions can act on any given round. When they do, they become ineligible to act on the following round. Therefore, very often you’ll have two eligible and two ineligible factions on a round. However, since players can see what card is coming up on the following round, they may opt to pass if the card is really good or really bad for them, keeping their eligibility intact for the following round so they have a chance at managing the card. Additionally, if you’re the first faction to act, taking your action can impact what actions are (or not) to the second eligible faction. It’s a delightful little web of decisions, strung from those two simple cards and a simple track on the board. Being able to use your action decisions as a weapon against others is… kind of awesome. So far, I’ve been playing Andean Abyss as a multiplayer solitaire game. Despite never being very good at managing multiple players by myself, COIN games work well this way. There’s no hidden information, and the plan for each factions victory is plainly outlined for all players to see on their player aid. The only trick is “switching gear”, where you stop thinking about the last faction’s victory, and start thinking about the current factions victory. From a solo gaming perspective, COIN seemed to be what I was looking for. I could play every side of the conflict fairly easily and get enjoyment from it. In fact, I was so enamoured with how clever the system is, and how well it played solitaire, I went ahead and picked up the most recent COIN in the series – Volume V, Liberty Or Death: The American Insurrection. This one was designed by Harold Buchanan, but still based on Ruhnke’s system. I’ve always been a fan of the American Revolution, and how it inspired the French Revolution, which introduced the world to Napoleon Bonaparte less than fifteen years later. I knew of We The People, Saratoga, and the Academy Games euro 1775: Rebellion. Though these all looked interesting (and I’m still trying to acquire a copy of 1775: Rebellion), nothing ever enticed me quite enough to jump in and learn a game centred around the American Revolution… nothing until Liberty Or Death: The American Insurrection. That’s a testament, I think, to how much affection I’ve been building toward the COIN system, and how it brought fresh perspective to these struggles. COIN was making these complex wars more relatable for folks like me, who maybe aren’t as well versed with their intricacies. Certainly, my interest in these games seems to often spur new curiosities that extend outward from the game itself. Once I began playing Liberty Or Death, I started wanting to know more. I began reading articles on the politics of the Thirteen Colonies, the politics that birthed the American Revolution. I listened to Mike Duncan’s Revolutions podcast. I started watching AMC’s “Turn”. I was hungry for more. Leaders add a new dimension of flavour to Liberty Or Death. Accessibility seems to be a huge factor to the success of COIN. While more elaborate than the average euro, they contain enough familiar elements to allow non-wargamers to feel comfortable with approaching the system, provided they have some sense of what they’re getting into and are looking for that taste of historical or political gaming. Folks who might be intimidated by hundreds of tiny counters on a sea of hexes may feel quite comfortable with COIN. I certainly felt comfortable enough that with Liberty Or Death I decided to take the next step and try the “bot” system. This is the Non-Player set of rules that manages the actions for your opponents in a true solo game. Players can choose to play any faction they like (or a “side” made up of two factions), but they’ll have the bots handle the AI for the rest of them. After I finished playing through the tutorial, I decided to try and get a handle on the bots. At first, I wasn’t sure if maybe I’d made a mistake and dived in too far, too fast. “These bots are taking our jobs!”, cried all my invisible wargaming friends. Learning the Non-Player system will have you reading about eight pages of rules that cover a variety of special cases, conditions, and flowcharts that dictate the actions of the Non-Player faction. There’s a chart to select random locations, and a map that manages the movement of Non-Player forces. It’s been a bit of a slog – an intimidating process of first getting to understand the core system and then applying all these Non-Player caveats to that system. Most of this is covered by the Non-Player faction flow charts and player aids, which are nicely laid out, but it’s procedural – so there’s some work required. It felt less like fun, at this point, and more like doing my taxes. Ever so slowly, however, the flow of the system started making sense. I’m still checking against charts for every non-player turn, but I’m getting how it works. If that seems like a lot of effort, well… it is, but the upside is that these bots are starting to teach me how each of the factions should be played, in a high-level sense. They’re showing me the programmed thought process of each faction, and teaching me how insurgency works. Aside from Andean Abyss and Liberty Or Death, there’s Fire In The Lake (the Vietnam War, from Mark Herman and Volko Ruhnke), Cuba Libre (Castro’s Insurgency, from Jeff Grossman and Volko Ruhnke), and A Distant Plain (Insurgency in modern day Afghanistan, from Brian Train and Volko Ruhnke). There’s also the upcoming Falling Sky (the Gallic insurgency against Caesar, from Volko Runke and Andrew Ruhnke), Colonial Twilight (the French-Algerian war, from Brian Train), and Pendragon (the ousting of Rome from Britannia, from Marc Gouyon-Rety and Volko Ruhnke). While these are all COIN games utilizing the same foundational system, there appears to be significant design flourishes and modifications to each title that make the system feel fresh every time I sit down with a new volume of it. If you’re at all a fan of history or politics and you’re interested in learning more about any of these conflicts, these games can act as systems to help players understand the inner workings of the conflict. Unlike reading a book or playing a video game, players are intimately engaged with the mechanisms that propel the narrative, helping to perhaps give them some insight as to why the story, in real life, may have unfolded the way it did. Of course, while some players might use COIN as a method of historical elucidation, others won’t invest themselves that deeply in the narrative of game. They’ll instead play it strictly as a strategy to be cracked, and that’s okay too… because even if you’re here solely for the test of tactics, eventually you’ll end up asking yourself questions about the game. Why was that card written to behave that way? What’s the story there? Diving in, even if you’re a fan of heavier games, I’d strongly recommend you start with one of the lighter COIN titles. Don’t let the fact that the COIN’s all run on the same framework fool you; they have varying degrees of involvement, and while there’s nothing saying you can’t learn Fire In The Lake first, you should know that it might be the most elaborate and complex of the COINs. It’s also the first to utilize multiple setup “scenarios”, where earlier games only came with a single setup, relying more on the card shuffle to mix things up. UPDATE: I’ve been told A Distant Plain was actually the first to feature multiple scenarios. I stand corrected! By all accounts, Andean Abyss or Cuba Libre are the best places to start. Liberty Or Death might be the next best jump, following by the heaviest of them… Fire In The Lake and A Distant Plain. No matter which title you choose to start with – begin with the tutorial. You may not like tutorials, but trust me here… it will guide you through the setup, through the basic rules structure, and give you examples of all the key commands for the various factions. The designer notes are also pretty valuable for going beyond the rules and learning the “why” of the game. The “why” of games like this are sometimes hard to reconcile with the mechanics, but when you take the time and effort to chase it down, you suddenly get a clearer picture of why certain design decisions were made. These mechanics are mapped onto the reality of these conflicts in subtle but realistic way. What you end up with is a zoomed out, macro view of the politics of these conflicts, and a clear picture of the forces that you control – the forces that helped shape this insurrection. When it’s all over and the dust has settled, I get a real sense of the weight of the events that just transpired. This, maybe more than anything, is what ended up convincing me that the COIN titles deserve a spot on my shelf. ¹ According to Ruhnke’s BGG user page. Actually, A Distant Plain has short, medium, and long scenarios which does change the starting setup on the board. Aha! I was misinformed! I guess I would have known this if I’d just waited to write this story an extra month or two, or whenever my P500 copy of A Distant Plain arrives. Thanks! Hi there, just one little remark concerning your mention of the French Revolution. It was not led by Napoleon Bonaparte but was in essence ended by him upon his successful coup on the Directory whereupon the Consulate was put in place; something along the lines of the Roman Triumvirate system. This was finally eroded when Napoleon consolidated his power and created his Empire. Otherwise, a great article! I am a largely solo gamer myself (when it comes to wargames) and I have one COIN game already (Cuba Libre) but i haven’t played it yet. I think this article has inspired me to take it off the shelf finally. Great overview of the COIN games! I have pre-ordered Falling Skies, which will be my first experience with a COIN game, but I am very excited. Falling Sky should be quite good. I’m really interested to see an ancient history COIN now that we’ve seen our first pre-20th century COIN. Pendragon is another I’m eager to play. Colonial Twilight sounds really intriguing too – being a 1-2p COIN. Two minor quibbles, however. Firstly, Napoleon Bonaparte didn’t “lead” the French Revolution, he brought it to an end. Secondly, in the 70s and 80s, wargames were NOT entirely resolved on hex maps. There were numerous area-movement games back then, such as “Fall of Rome” and “1812”, to name just a few. You’re correct. Thankyou! I’ve reworded my sentence on the French Revolution to make it sound better. I very much enjoy the coin series and own several of the games and will continue to purchase new titles. They are a lot of fun. Even solitaire. My biggest complaint is that the endings don’t always make sense from a narrative point of view. If you run out of cards before an automatic victory occurs, the game ends. You don’t always get that climatic Yorktown or fall of Saigon. Just doesn’t feel like there was a real victory. But maybe that’s the point as at least one of the conflicts portrayed in the series is still going on. Very nice introduction to COIN indeed. I came to COIN from a heavy euro background. And I think more and more people do. “… These games can act as systems to help players understand the inner workings of the conflict”. Well put. And those “systems” are so reliable that every time I play a COIN game (mostly solo too) I get to figure out something new, however tiny, about the conflict it depicts; a new piece in the mosaic. That’s what keeps me so interested in those titles. And I think it is good advice to study the non-player rules and flowcharts. As you mention they are probably the best way to learn how to play each particular faction better.